Always on the lookout to try new cuisines, we received an advertisement for Toros in the mail. Turkish–something not often found around here. So, we took the kids out for dinner tonight to check them out. The first thing you notice is the (mandatory?) valet parking. Their parking area is small so it makes sense that they would prefer to manage it with valet parking. I had called ahead to reserve our table and when we arrived we were seated promptly. The decor is nice–it has a lot of character, but not overly kitschy. Turkish cuisine is typical Mediterranean: Turkish, Greek, Middle-Eastern, etc. are all very similar. You’ll find plenty of familiar dishes, but a bunch that are uniquely Turkish. We were in for quite a treat! We ordered two appetizers: the Midye Dolma (stuffled mussels, cold dish) and the Arnavut Cigeri (fried veal liver, hot dish). I wasn’t terribly impressed by the mussels, but the fried veal liver–it was fantastic. We ordered three entrees: one was lamb cubes over eggplant sauce, one was Levrek (broiled striped bass), and the last was Manti (tiny beef dumplings in yogurt sauce). 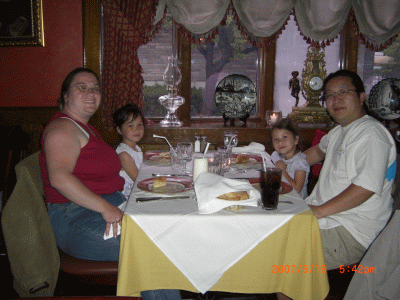 All three dishes were incredibly good–some of the most well-prepared dishes I’ve had. The desserts were excellent too. After carefully looking over the dessert tray, the girls decided they wanted three of them: Kadayif (shredded wheat with walnuts and pistachios dripping with syrup), Keskul (white almond pudding) and Sutlac (oven-baked rice pudding). My wife decided to get a cup of Turkish coffee to try and yes, its reputation for being “like mud” is accurate. I’m not a coffee drinker, but the sediment in the Turkish coffee reminded me of very, very dark chocolate–very rich and bitter. Combined with the syrupy sweetness of the Kadayif, it was incredibly delicious, albeit a bit gritty. The prices at Toros are extremely reasonable–$4-6 for an appetizer, $10-15 for an entree and the portion sizes are very generous, $3-4 for a dessert–a lot less than I would have expected for a place with such good food and classy atmosphere. 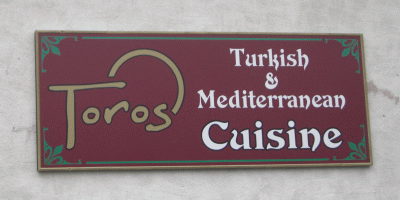 If you’re looking to try a different cuisine and you’d like to try Turkish, I highly recommend Toros Restaurant in Clifton, NJ.